Donald Trump has the lowest six-month approval rating of any president. Americans give President Donald Trump the lowest six-month approval rating of any president in polls dating back 70 years, punctuated by questions about his competence on the world stage, his effectiveness, the GOP health care plan and Russia’s role in the 2016 election. Just 36 percent of Americans polled in a new ABC News/Washington Post poll approve of Trump’s job performance, down 6 points from his 100-day mark, itself a low. The previous president closest to this level at or near six months was Gerald Ford, at 39 percent, in February 1975. Sixty-three percent in this poll, produced for ABC News by Langer Research Associates, say it was inappropriate for Trump’s son, son-in-law and campaign manager to have met with a Russian lawyer during the campaign. Six in 10 also think Russia tried to influence the campaign, and among those who say so, 67 percent think Trump aides helped, similar to results in April. Yet the Russia controversy is just one on the list of Trump’s troubles. Just 38 percent say he’s making significant progress toward his goals; 55 percent think not. 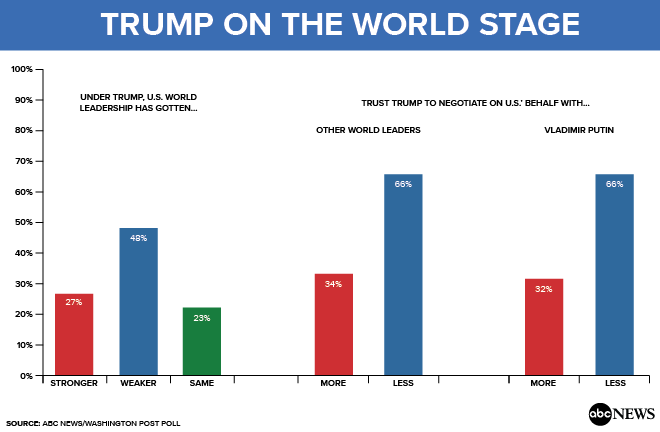 With no apparent help from the G-20 summit, two-thirds don’t trust him to negotiate with other world leaders -- or with Russian President Vladimir Putin specifically -- on America’s behalf. And about half say the country’s world leadership has grown weaker under Trump; just 27 percent say it’s gotten stronger. 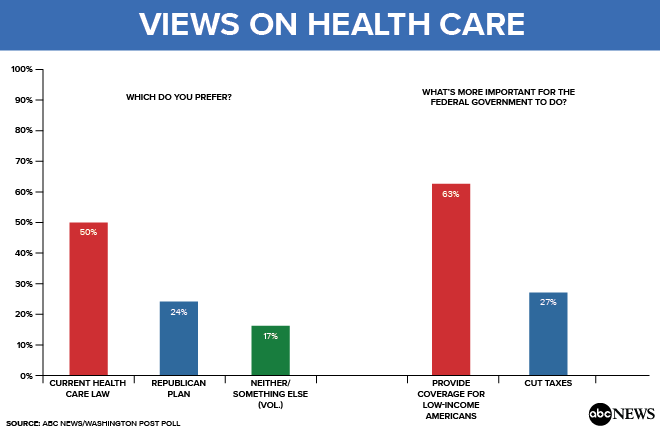 On his party’s signature campaign issue, health care, Americans by a 2-1 margin prefer Obamacare over the Republican plan to replace it, 50-24 percent. (Another quarter either want something else entirely, 17 percent, or are undecided, 9 percent.) “Strong” preference for the existing law surpasses strong preference for the GOP plan by 20 percentage points. Relevant to proposed GOP cuts in the growth of Medicaid, the public by a broad 63-27 percent says it’s more important to provide health care coverage for low-income Americans than to cut taxes. For more expert insight, check out “The Briefing Room,” where Chief White House Correspondent Jon Karl, Senior White House Correspondent Cecilia Vega and the rest of the ABC News politics team will be analyzing the White House press briefings LIVE starting this week. You can catch “The Briefing Room" on ABCNews.com, the ABC News app, and on ABC News’ Facebook and YouTube pages. Trump also suffers from weak personal ratings, a topic to be covered in a further report Monday morning. But two factors temper the situation for the president to some degree: weakness in his Democratic opposition and greater strength on the economy. 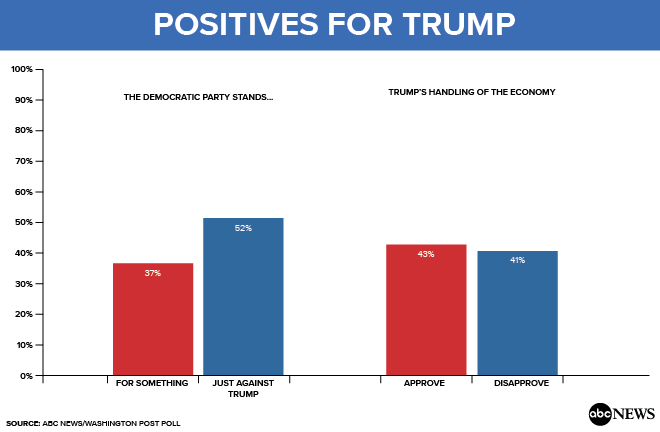 On the first of these, only 37 percent of Americans say the Democratic Party “stands for something,” while 52 percent say it just stands against Trump. The perceived lack of an affirmative agenda weakens the Democrats’ efforts to capitalize on Trump’s failings. 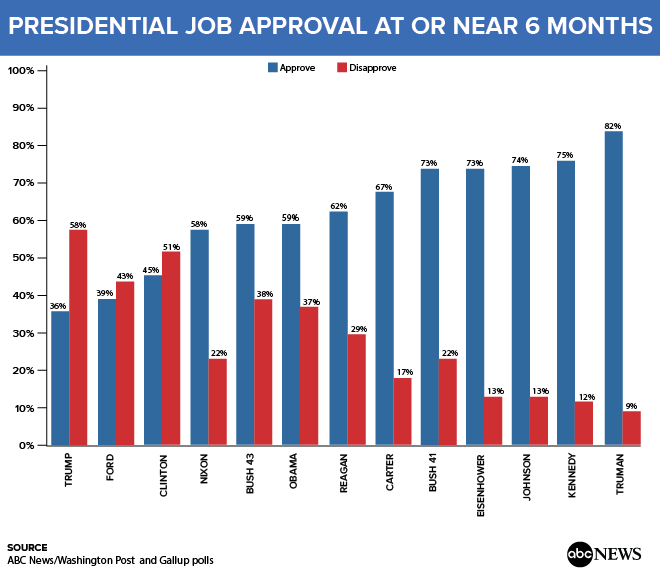 On the second, Trump’s overall job approval rating (36-58 percent, approve-disapprove) is surpassed by his rating for handling the economy, 43-41 percent, roughly an even split. An unusually large 16 percent aren’t ready to rate his economic performance; it was only 3 percent for President Barack Obama at six months. From another perspective, Trump’s 58 percent disapproval is 7 points higher than the next-highest disapproval rating at six months, President Bill Clinton’s in 1993. Asked to make their own comparison, half of Americans say Trump is doing a worse job than most previous presidents, vs. 23 percent who say he’s doing better (including 38 percent “much” worse vs. 17 percent “much” better). The rest, 24 percent, say he’s performing about the same as his predecessors in general. Results are similar when it comes to the world stage: Americans by 48-27 percent say the United States has become weaker rather than stronger on the world stage under Trump, again with a substantial share, 23 percent, saying this has remained about the same. Results on Russian interference show how attitudes about political issues can harden. Even though U.S. intelligence agencies have reported “with high confidence” that Russia sought to influence the 2016 election, four in 10 Americans either don’t think it happened (31 percent) or are unsure (9 percent), and recent disclosures haven’t changed that. This leaves six in 10 overall who do think the Russians tried to influence the election; in this group, 72 percent think Trump benefited and, as noted, 67 percent think members of his campaign intentionally helped those efforts. As a combined total, the number of Americans who both think that the Russians tried to influence the campaign, and that Trump aides helped, is 41 percent -- very similar to the 40 percent who don’t think Russia was involved, or are unsure about it. That said, two other overall results are less equivocal. Americans by 52-37 percent think Trump is trying to interfere with investigations of possible Russian influence, rather than cooperating. (It was 56-34 percent in early June, after Trump fired FBI Director James Comey.) And by 63-26 percent the public says it was inappropriate for Trump’s son, Donald Trump Jr.; son-in-law, Jared Kushner; and campaign manager, Paul Manafort, to meet last June with a Russian lawyer who was said to have damaging information about Hillary Clinton. Differences among groups mark the partisan nature of these times: At the most extreme, Trump ranges from a 90 percent approval rating among conservative Republicans to 5 percent among liberal Democrats. And leaving aside ideology, the gap is nearly as wide by partisanship alone -- 82 percent approval for Trump among Republicans vs. 11 percent among Democrats. The deciding vote, as ever, is cast by independents, and just 32 percent approve. Results are telling among other groups as well. Trump’s approval rating is 12 points higher among men than women, 42 percent vs. 30 percent; just 27 percent among 18- to 29-year-olds vs. 42 percent among seniors; and 29 percent in urban areas vs. 40 percent in the suburbs and 44 percent in rural areas. Sixty-one percent of evangelical white Protestants approve of Trump’s performance, as do 55 percent of white men who don’t have a college degree -- two mainstays of his election coalition. His support drops by 20 points among non-evangelical white Protestants vs. evangelicals, and by 24 points among college-educated white women vs. white men who lack a degree. Further, while 45 percent of whites overall approve of his work, that drops to 19 percent of Hispanics and 15 percent of blacks. While generally less extreme, several of these are reversed in views of the Democratic Party. A quarter of Democrats (27 percent) say their own party “just stands against Trump”; so do 55 percent of independents, soaring to 82 percent of Republicans. Men are 15 points more likely than women to hold this opinion, and 58 percent of whites see the Democrats as simply anti-Trump, compared with 31 percent of blacks, long among the most loyal Democratic groups. One other result is telling in a different way: Senior citizens are 11 points more likely than young adults to think Russia tried to influence the election, 66 percent vs. 55 percent. Seniors, of course, will have the sharpest recollection of the Cold War, which is supposed to be long over. This ABC News/Washington Post poll was conducted by landline and cellular telephone July 10-13, 2017, in English and Spanish, among a random national sample of 1,001 adults. Results have a margin of sampling error of 3.5 points, including the design effect. Partisan divisions are 35-23-35 percent, Democrats-Republicans-independents. The survey was produced for ABC News by Langer Research Associates of New York, New York, with sampling, data collection and tabulation by Abt Associates of Cambridge, Massachusetts. See details on the survey’s methodology here.